On the north side of the junction between Fawcett Road and Heyward Road, Southsea. St. Matthews was originally a Mission Church which was established in 1889. In 1904 it was decided to split the parish of St. Bartholomew and create a new parish of St. Matthew. The vicar was to be Bruce Cornford, a charismatic high churchman with lofty ambitions. For him the old Mission Church was not big enough and so a new church was needed. This was to be built on land between Heyward Road and Fawcett Road. 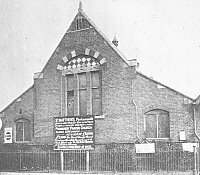 It was finally opened in 1924 at which time the old church was converted into a Parish Hall. Neither the new nor the old church survived WW2, the old being completely demolished and the new being left without a roof. A new parish hall was built on the site of the old and a new church dedicated to the Holy Spirit was created from the newer St. Matthews. Thanks to Peter Lapic for the information that made this page possible.